so I thought I'd jazz it up a bit with a different heel flap and toe. Forget that this puppy is 9 stitches to the inch on size 0s, which for me is almost making me go blind. Seven, no problem. Eight and I'm getting a little twitch over my eye, but nine.... something does not compute for me. I can never truly be a lace knitter but I'm gonna have to fake it. 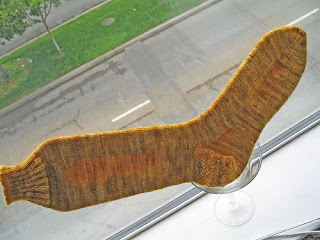 So, I tried this groovy heel flap called Eye of Partridge which I learned in Stephanie Pearl McPhee's "Knitting Rules". It's a variation on the standard slip stitch pattern which creates a honeycomb-like structure that really pops when done correctly. About halfway through, I think that I've done something wrong because it looks too flat (no honeycomb hideout action). This causes me great distress because you can't simply rip back because of the slip stitch action. I suppose someone with a bit more experience than I could have done it, but I'm not Meg Swansen or Brooklyn Tweed, so I totally ripped back and started over. About halfway through the second time, I notice the same thing happening again. This time, I decide it's a combination of my tension and the subtle changes in the color that are obscuring the stitch pattern, so I perservered and ended up with this. 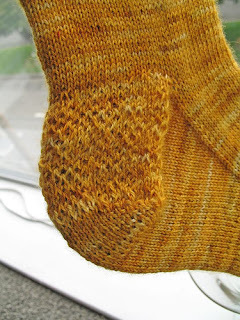 Next up was the digital yogic bliss of simple stockinette for the foot until the toe was reached. To tart it up a bit, I decided on a French Toe which I spotted in Nancy Bush's "Knitting Vintage Socks" and thought it would be parfait (not the poor white trash "dessert" of whipped cream and jello... which is more imparfait or "vachement nulle" as French teenage hipsters might say.... but I digress). This might have been okay, but I was using two circular needles instead of Nancy's recommended 3 needles, which translated to a bit of juggling stitches and markers. A slight handicap was introduced by a lovely Merlot that Scott and David gave us for Christmas and about three rows from finishing, I realize that I've been decreasing at the wrong points. I almost bent the metal tips of my needles with the sheer force of my anger, but decided NOT to rip back until I was sober the following morning. In order to atone for my hubris, I did a standard wedge toe with a kitchener stitch close. And so I present the lovely one sock for Article Pract. They only wanted one because they get stolen if you do a pair. What a lousy world, eh? 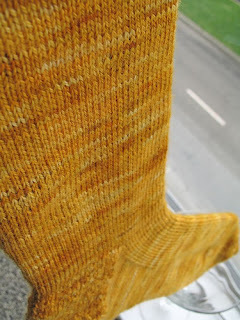 Next up is a groovy swatch featuring a pattern from Barbara Walker's "Treasury of Knitting Patterns" (vol. 2) that is testing my ability to count, follow a lace pattern and not split the fine yarn with my crappy needles. I haven't taken any pix yet, but I can report that I have ripped this back twice because I keep forgetting about the border (which is not part of the pattern repeat) and I constantly lose my place in the pattern repeats. I have been jonesing for a Socktopus post, so I thank you. I also feel inspired to return to my own knitting, so I thank you again. In exchange, I want to share a lace ripping-out story with you, but I'm afraid I might weep copiously in the same way I did on my living-room floor that night so many years ago. 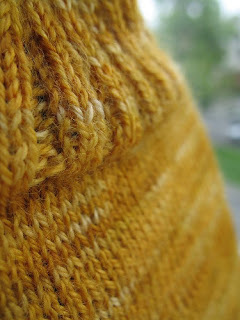 I don't know if nonknitters realize how emotional it can be! Xtina, you bring the cereal, I've got the milk. Chi Chi, you must share! JPK, you'll need to steal it from Article Pract... but don't tell them I told you where it is. Oh, and my apologies for the typos. You'd think there wasn't a spell check on Blogger. Jeez!! !